The whole Smartly.ai team would like to thank you for making the 2nd edition of the Smart Voice Summit a success! 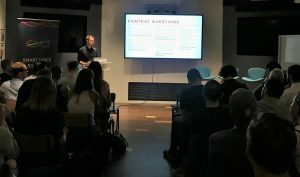 The event took place in London on June 21st, gathering representatives from the voice community along with other voice enthusiasts. Speakers from Smartly.ai, Google, Amazon, BBC, Opearlo and more shared their insights in forms of keynotes and panel sessions. Following the event’s hashtag #SVS18, attendees or not, people were able to share their reviews and we were glad to receive much positive feedback about the event. Let’s check out some of the key takeaways from this summit! With the society’s rapid-changing technological advancement, it’s safe to say that Voice plays a vital role in doing so. 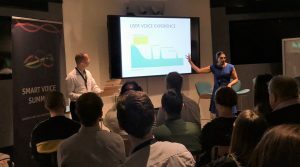 By facing serious challenges and overcoming them, this event’s theme was focused on Pushing the Voice Industry Forward, in which everyone was favouring for. The host for this edition of the SVS was Kane Simms, Host on VUX World, who has an awesome podcast in which he publishes new interviews every week. You should definitely check it out, we guarantee you that you won’t regret it! The Smart Voice Summit kicked off with Ben Sauer, who demonstrated how to Find your Use Case. Looking at the context of the problem, brainstorming the solutions and focusing on a good one, all whilst considering customer services, user research, brand creativity and the future. Alice Zimmermann, UK Google Strategic Partner Development Manager, held the topic of Focusing on Actions. Bonus features, such as being polite and charming, remembering the users last interaction and planning entry and exit actions. And according to Max Amordeluso, Amazon’s Alexo Chief EU Evangelist, Alexa should be Everywhere, as voice is mainly built for old people and kids, since they are the most engaged markets, and it is there to help them. People’s relationships with their voice assistants starts really well. They discover its good functions but then lose interest, until some social occasion encourages them to play with the device again, and this happens in a loop. Every action should include a feedback loop where the consumer can feel part of the process of making the action/skill better. Hemal Gill and Chakib Labidi’s keynote, Qualitative Insight into Voice Users, concluded that voice is vital for building relationships. You can find the presentation here, and you can contact them for further observations! Voice professionals from across different fields participated in this panel, which held topics related to User Experience, Privacy, Trust, Challenges and the Improvements that should be made. Points included the ways of designing voice in a way for it to be natural, taking into matter that it is for everyone. It is essential to build solutions and personalize it, regardless of the age and abilities. It’s vital to explore the integration of voice and vision technologies for a richer immersive experience and a better contextual understanding. The event was concluded by the launching of the DAA, a global non-profit association. It is created by several visionary companies, with the goal of driving the best conversational user experience, everywhere and on every device, regardless of brand. Click here to know more about it! Thank you to all of you who have attended and to everyone who has supported the event in different ways! 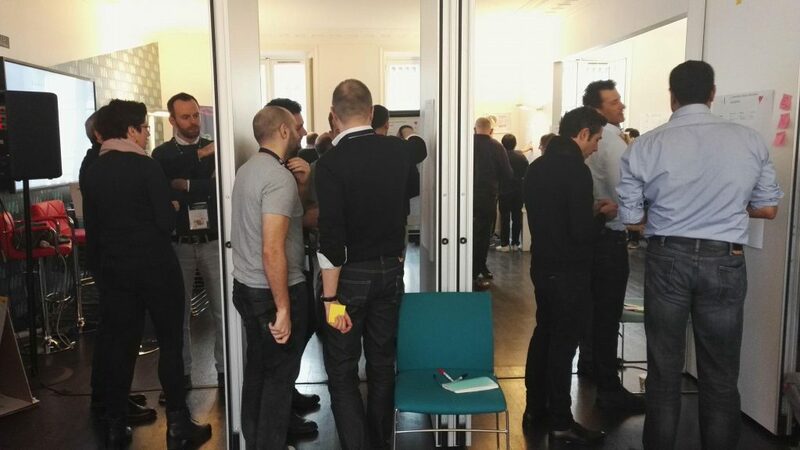 The Paris edition of the Smart Voice Summit is coming back bigger and better and we can’t wait to see you all again! And a big thank you to Paige Hobart’s insights on this article! Wanna stay in touch for everything voice and for all Smart Voice Summit news? Sign up to our newsletter, we will provide you with everything you need to know! Smartly.ai can be proud to say that they made bots project which they were passionate about reflecting a fresh, timeless and trendy vision. In partnership with Rosbeef! for evian© Smartly.ai succeeded to create the perfect Paris City Guide chatbot. The chatbot is a interactive guide inspired by the city which is the reflection of a vibrant and curious brand as evian© tend to be. The City Guide lists more than a hundred of the young and trendy must-see places in Paris identified by Le Bonbon©. The app provides the best spots in Paris for restaurants, shopping or cultural outings. Forget about paper guides or endless researches for the best spots in Paris. The only thing to do to start the experience is to be connected to the brand Facebook page via Messenger or flash the QR code on the water bottles (5 millions water bottles have been released). 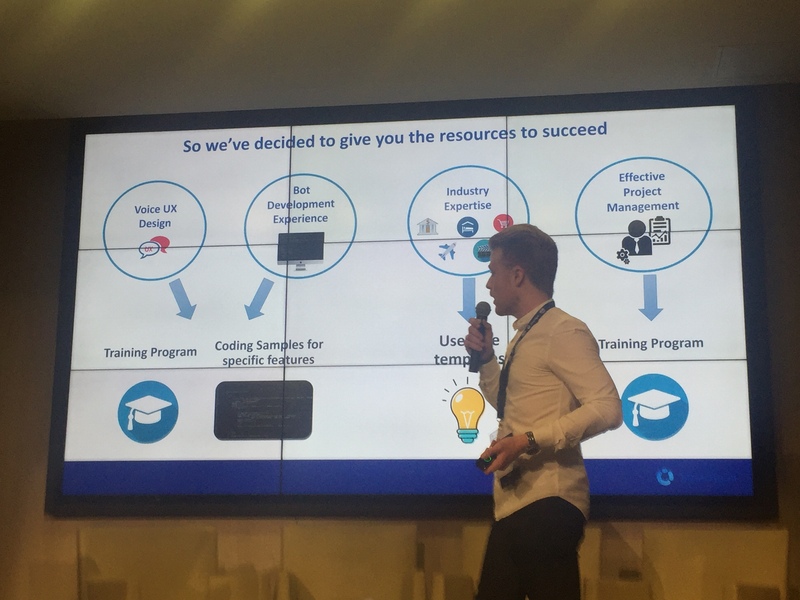 In charge of tech development, Smartly.ai (reference solution for chat and voice apps building) created a Messenger chatbot providing geo-tracking features which makes able users to go directly to the address chosen. Available in French and English, the chatbot targets young working person and families from Paris as well as tourists. Connecting everyone to its digital assistant, everywhere. The DAA is a global non-profit association created in June 2018, by several visionary companies with the goal of driving the best user experience, everywhere and on every device, regardless of brand, using a new standardized technology named Open-AI. As a start, we would like to enlarge the collaboration between Amazon Alexa and Microsoft Cortana to other assistants such as Google Assistant or Orange Djingo. Then, we could explore ways to secure and enlarge this circle, by releasing and adopting a standardized protocol for the upcoming assistants, to be cross compatible too. A few weeks ago, two of the most popular digital assistants, Amazon Alexa and Microsoft Cortana have been shown working smoothly and in total cooperation (article + video). This is a notable achievement that should be extended to other digital assistants providers. Why? Well because, the largest the choice the better it is for the user who can find more personalised answers, as well as benefit of a wider skillset. Our plan at the DAA is to enlarge this circle letting all the other popular assistants join the Party. We want a world where Alexa, Cortana, Watson, Assistant, Djingo, Bixby and other upcoming digital assistants are totally interoperable. We think users should always have the ability to talk to their favorite assistant whatever the device they are using, with the guarantee that their personal data would be easy to move. The first pragmatic achievement for the Alliance is to specify, release and adopt a standardized protocol for the current and upcoming assistants to be totally cross compatible regardless of the hardware. 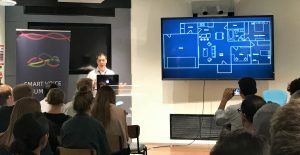 • June 2018 – SVS London: First physical workshop with founding members. Incorporation. Don’t miss this very unique opportunity to shape the future! 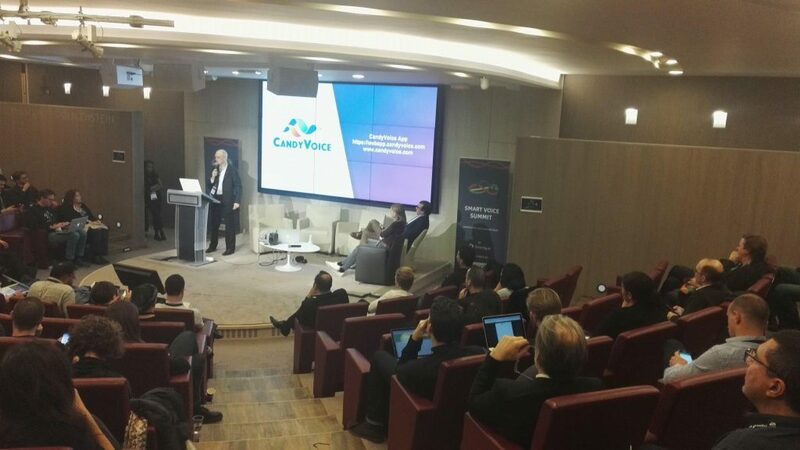 The Smartly.ai team held its first Smart Voice Summit in Paris, which was the first event ever dedicated to voice assistants in Europe. Following the success of the first voice technology event, we are happy to announce that the 2nd edition of the SVS is coming back on the 21st of June 2018, in London. This event will bring together the industry’s leading solution providers to get insights on the latest research and product development of everything voice, in the form of keynotes, tables, workshops and network opportunities. Speech is the most natural way for humans to interact. There’s no denying that digital assistants have become vital players in our day-to-day lives, whether we use them in our homes, cars, mobiles, or brands. That is why, we are delighted to see the expansion of the voice ecosystem. What makes this SVS stand-out? This Smart Voice Summit will set a remarkable date with the release of its Digital Assistant Alliance (DAA). The DAA is a global non-profit association, created by several visionary companies. The goal is to drive the best conversational user experience, everywhere and on every device, regardless of brand. The main SVS is held in the heart of Paris, having several summits branch out in the major capital cities, such as London. The purpose of this expansion is to live up to our vision and push the voice industry forward, by gathering the different key players of the Voice Industry from around the globe and work hand-in-hand. 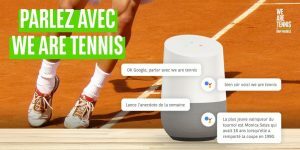 BNP Paribas Group launched, months ago, We Are Tennis (media dedicated to tennis lovers) on Google Home. The group was amongst the leaders to be convinced by this Voice Revolution which is moving forward and it is with fervor and trust that BNP Paribas gets involved with Smartly.ai, once again. The main goal? Make the voice app more human, alive and entertaining ! It is no longer about simply giving a player’s location in real time or matchs’ scores.The interaction with the users evolves towards an enhanced and more interactive experience. 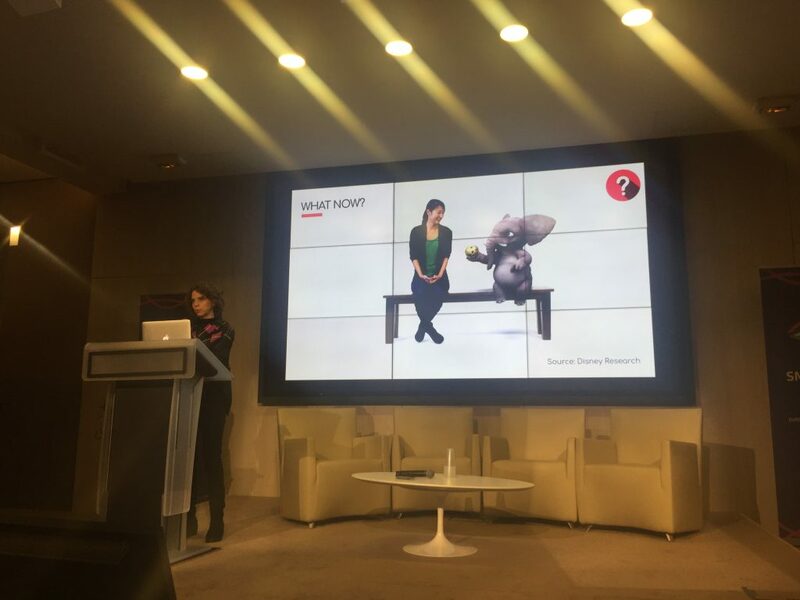 In collaboration with the BNP Paribas Group, Smartly.ai was able to develop a friendly, participative and recreational media by including quizzes, weekly anecdotes and exclusive audio contents. The gamification of voice applications is growing bigger day by day and offers a capital gain by winning the customer’s loyalty. The exchange between the user and the voice application is no longer unilateral, the user is now participating to the conversation and test his knowledge with the quizz by recognizing the players holler. We Are Tennis is able, once again, to diversify itself from other medias by adding a gaming section. The gaming section is not the only update, the website contents and the player’s descriptions are transcribed in the immaculate editorial style of the brand. The interaction with a hint of humor is transformed making it perspicacious and empathic. 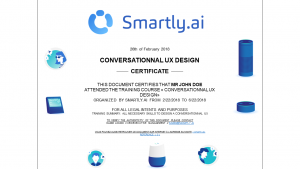 Banque Atlantique collaborated with Smartly.ai to launch ARY, the first banking chatbot in the UEMOA region, which was released on the 4th of April 2018. It cannot be emphasized enough that Banque Atlantique is making some breakthroughs with the ARY bot. Available on Banque Atlantique’s website (https://www.banqueatlantique.net/ ) and on Facebook Messenger, ARY is able to understand the requests of prospects and clients of the bank, and respond in a personalized manner, due to its artificial intelligence engine. What’s at stake? To propose a new client experience, thanks to a strongly increased reactivity. With the launch of the ARY bot, Banque Atlantique acts as a forerunner in its geographical area, an example that will most likely be followed by others. Moreover, Banque Atlantique has joined the closed club of the dozens of banks who have bet on the deployment of this technology at the regional level to act in a more immediate and efficient manner in the management of banking. In collaboration with Smartly.ai, Banque Atlantique has demonstrated its capacity of collaborating with an innovative company and mobilize a team which is dispersed over 9 countries, to deliver an Artificial Intelligence project within a period of 3 months. At a time of increased digitalization of services, Banque Atlantique aims to establish a privileged relationship with its clients, while profiting from the remarkable advances offered by the digital and artificial intelligence. The subsidiary of the BCP group holds in its ADN the value of proximity and engage a process of fidelity, all thanks to the ARY bot. ARY will be led to evolve with time but it currently offers the basic services, starting from simple information inquiry of the product to the simulation of credit. A few days after the launch, about 10,000 persons had requested the bot about one of the 50 themes it is able to answer. “ The utilization of Artificial Intelligence is part of the BCP Group innovation strategy which guarantees and searches permanently for new ways of improving the quality of service”. Banque Atlantique, a subsidiary of the BCP Group (Banque Centrale Populaire), is the 3rd biggest banking group in the UEMOA zone (Union Economique et Monétaire Ouest Africaine). It’s not that simple for brands to create and succeed a chatbot or voicebot. In fact most bots fails. 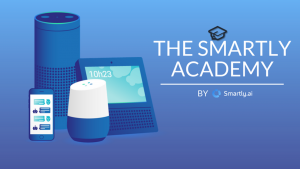 The Smartly AI came up with the Smartly Academy to help brands design successfully their bot solution. An untraditional back to school program to train brands on methods and processes to develop a bot strategy. Brands are mainly focused on the development part of the process forgetting about the design which appears to be the most important thing to care about. The Smartly AI team believes in a motto: “A GOOD DESIGN FOR A BETTER BOT”, a successful bot lies on 90% of design and 10% development. Once you get that, everything is possible and bots will be this strong added-value you need to improve your customer experience. It is no news that quality matters over quantity, your bots can have the best developments on the market but you won’t get the outcome expected without a great design and the Smartly Academy gives you all the keys to get that. You will benefit a thorough follow-up through: guidance, design, application and bot training. Each module is eligible for a dedicated certification, if you complete all of them, you will be certified as Bot Master by the Smartly Academy and get this awesome degree! The training courses are mainly for brands and partners but there are also available for developers, system integrators or digital agencies. In our new e-learning platform, which is currently in an invite mode only. Training courses will be giving out depending on your needs and expectations as well as the training length. Our bot trainers can come to train your team. Interested? Shoot us an email with your location details to get a quote and your access! 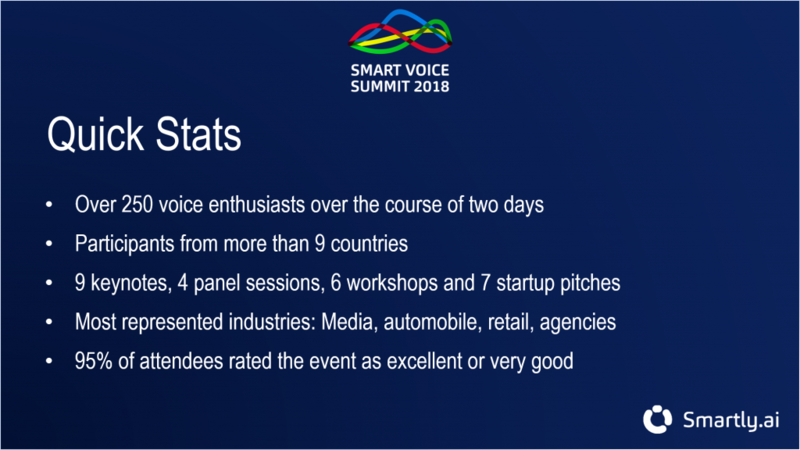 Thank you to everyone who participated in the success of the first edition of the Smart Voice Summit! The two day event welcomed over 250 voice enthusiasts, who participated in keynotes, panel sessions and workshops proposed by Smartly AI and partners including Google, Amazon, BBC, Sephora, Orange, The Financial Times, Deezer, Acapela and more! There was a great reaction on Twitter throughout the day, with the hashtag #SVS18 enabling those who were not present to get insights on the event! Here is a brief summary of the event, which took place on the 1st and 2nd February 2018. So, what were some of the key takeaways? #1 Brands, the time is NOW! If the Smart Voice Summit confirmed anything, it is that 2018 is THE year of voice! 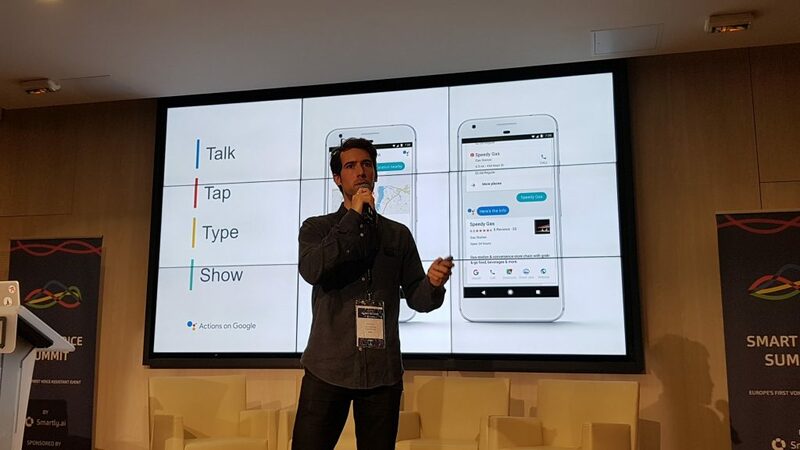 Peter Hodgson, Senior UX Design Lead, and Lionel Mora, Product Marketing Google Assistant EMEA, from Google presented day one’s flagship keynote, after the event was officially opened by Hicham Tahiri, Smartly AI’s CEO and co-founder. Their keynote, Embracing the Voice Revolution, addressed not only the importance for brands to have a voice presence (FYI, Google Assistant is now available on 400+ devices including phones, cars, speakers and fridges), but the importance of good design when creating voice experiences. Bret Kinsella’s keynote further confirmed the urgence for brands to create a voice strategy. 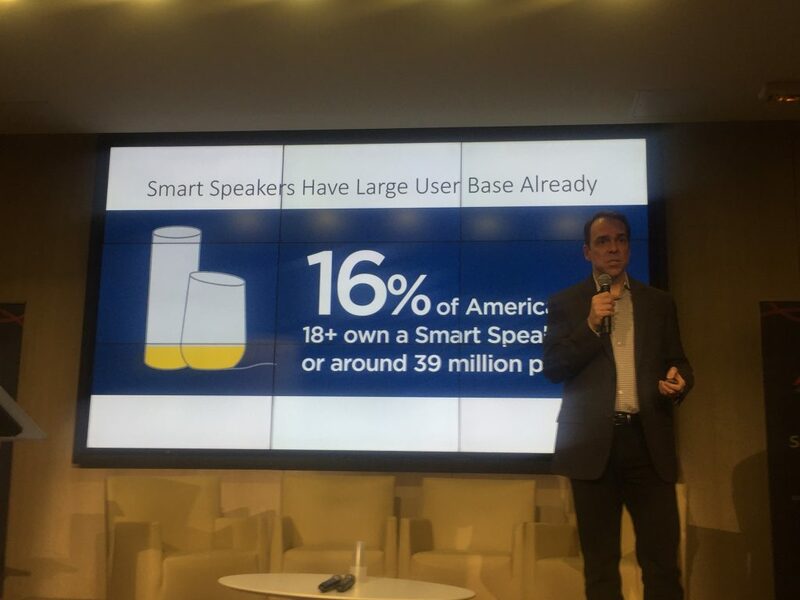 Technology advancement (machine learning can now rival human accuracy) and market readiness (16% of Americans own a smart speaker) create the ideal environment for brands to launch their voice app! According to Bret’s stats, currently 41% of consumers prefer voice to mobile apps or the web. The top reason for this is because it is more convenient! 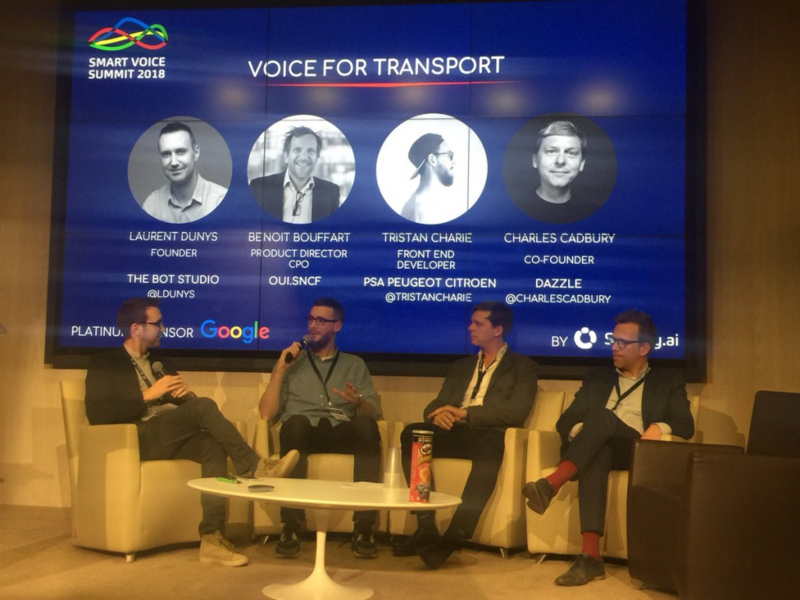 Panel sessions dedicated to media, transport and retail showed that all sector are being transformed by voice technology. The use cases vary from generating awareness and driving engagement to facilitating transactions and integrating into existing products. 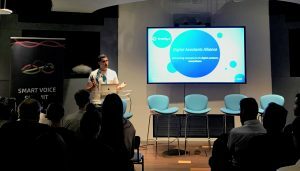 Mathieu Lima, Deezer’s Platform Product Manager, and Chris Gathercole, Head of FT Labs at The Financial Times also took to the stage to outline how voice was bringing value to their respective industries. Google’s workshop on day two showed participants how to design and prototype a voice conversation action using new Google Design Sprint methodologies! The key takeaway? Put the user at the centre of the app! Designers need to put themselves into the shoes of the user, take into account principles of social interactions and give the app a personality! 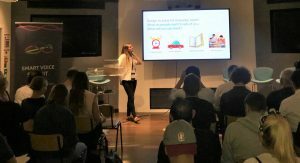 Amazon’s workshop also stressed the importance of good design, and Vui Agency and Deutsche Telekom’s workshop lead to some great examples of how emotion detection can be used to improve voice apps! With regards to testing apps, Clearleft’s UX Designer and Product Strategist, Ben Sauer, outlined how the Wizard of Oz can maximise the chances of voice success with a keynote that had a Star Wars twist! We are already seeing the emergence of voice devices with screens. As the mix of voice and vision becomes more common, applications will need to consider how they will handle other inputs coming from a touch screen or a camera. In addition to this, brands also must be multidimensional: multi input, multi user, multi device and multi channel! Karen Kaushansky’s (Consultant, Experience Design Leader) keynote addressed all of the aforementioned points and more. In the future we will also need to consider creating an app-less experience, conversational questions, more context and conversation, creating characters, emotion recognition and more. 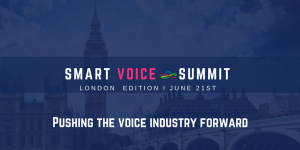 Voice professionals from across the globe attended the Smart Voice Summit. The Startup Spotlight enabled startups to showcase their company in a 3 minute pitch. From digital voice processing (CandyVoice) and the new generation of interactive voice servers (Voximal) to voice powered learning (Batvoice) and a voice tech consultancy agency that doesn’t charge a penny (Vaice), there is no shortage of innovation in the voice sector! Thank you to our sponsors – Google, WAI by BNP Paribas and Acapela; our speakers (not all are listed in this article, please click here to see the full programme), and of course, everyone who attended! 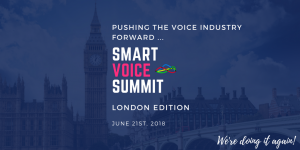 A London edition of the Smart Voice Summit is already in the pipeline! Sign up to our voice newsletter to keep up to date with the latest voice and Smart Voice Summit news! 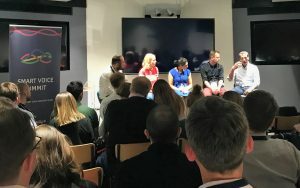 During the first edition of the Smart Voice Summit, Smartly AI revealed their Partnership Program, an ecosystem of voice first professionals to help brands succeed their voice strategy. William Bailey, Smartly AI’s partnership director, revealing the Partnership Program at the Smart Voice Summit. With the virtual digital assistant software market expected to reach $7.7 billion and 1 billion users in 2025, having a voice strategy is fast becoming a requirement, as opposed to an option. As a result an increasing number of brands are looking to launch a voice application. 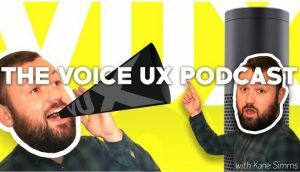 With more voice devices making their way into our homes, brands need to look more closely at how they create voice experiences in order to ensure that they bring real value to the end user. Creating a stand out voice application and launching a successful voice strategy is not always simple and requires several skill sets. Beyond developing the voice application itself, the conversation of the application needs to be well designed. This voice first interface is different to a graphical one, and the conversational path must be carefully considered in order for the application to be successful. In addition to all this, the application must complement and reinforce the brand’s image in order to become an integral part of the omni-channel marketing strategy. Smartly AI’s Partnership Program unites technical, voice design and brand professionals in one place. As every voice project is different, Smartly AI will analyse each brand’s requirements and put the brand in contact with the right partner(s) to make sure that they succeed their voice strategy. Got a voice project? Tell us more and let us connect you with the right voice experts! Head over to our partner page and select “Find a Partner”. Pssst, if you are a voice professional and interested in joining our Partnership Program, or want to find out more about how it can benefit and grow your business, click here! We are delighted to announce that Google will be the platinum sponsor of the Smart Voice Summit 2018! 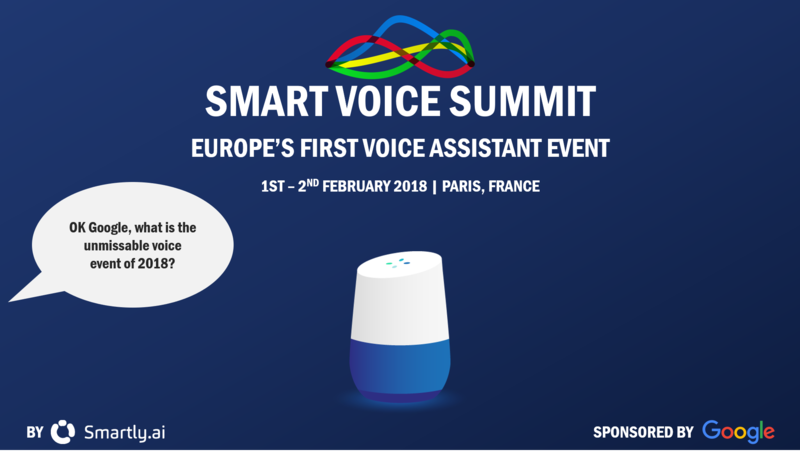 Taking place on the 1st and 2nd February in Paris, the Smart Voice Summit is the first event dedicated to smart speakers in Europe and aims to give business all the vital information they need in order to launch and succeed their voice strategies in 2018! The Internet (and voice) giant entered the smart speaker market in November 2016 with its first device and announced just this week at CES the arrival of 4 smart screens to add to its collection of devices. In Q4 alone the company sold 7.6 million smart speakers and brands such as Sephora, Accor Hotels, CNN, Domino’s, Kayak and Spotify have created Google Actions in order to better connect with, and enhance the experiences of, customers using these devices. In addition to a special voice first keynote by a surprise guest, Google will also be running a design sprint workshop for conversational interfaces! Major brands pioneering voice such as the BBC, Sephora, SNCF and Boulanger will also be in attendance at the event to outline the value that their respective voice first strategies have created. There will also be industry specific panel session: Voice for Banking, Voice for Retail, Voice for Media, Voice for Transport, addressing sector specific voice use cases, challenges and results. Click here for more information on the programme! Make sure your voice strategy is on point for 2018, take advantage of our new year promo price and reserve your spot now!